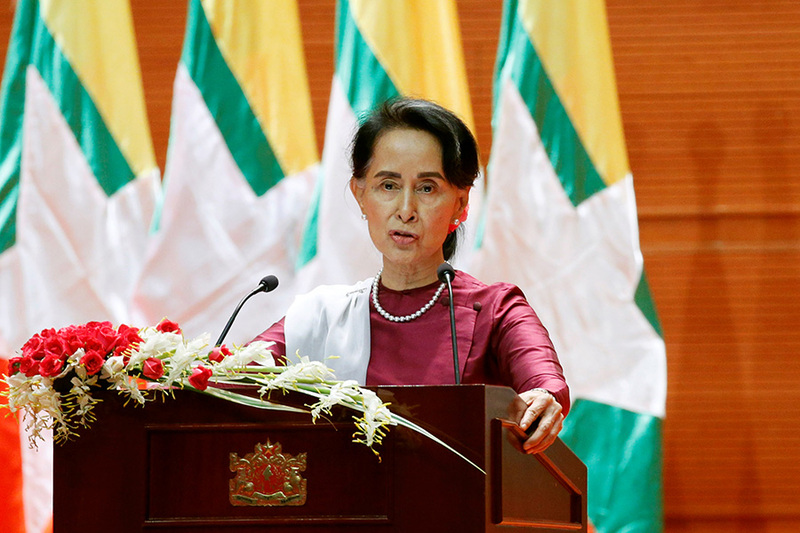 It is a perilous time for Myanmar’s fragile democratic transition. At stake are not only the lives of the 52 million people who live in the country, but one of the world’s newest democracies could disappear once again under authoritarian rule. Emerging from 50 years of military dictatorship, Myanmar is now facing new enemies together with old enemies—inside and outside the country—after coordinated attacks by Muslim militant group the Arakan Rohingya Salvation Army (ARSA) prompted military clearance operations and sparked conflict across northern Rakhine. 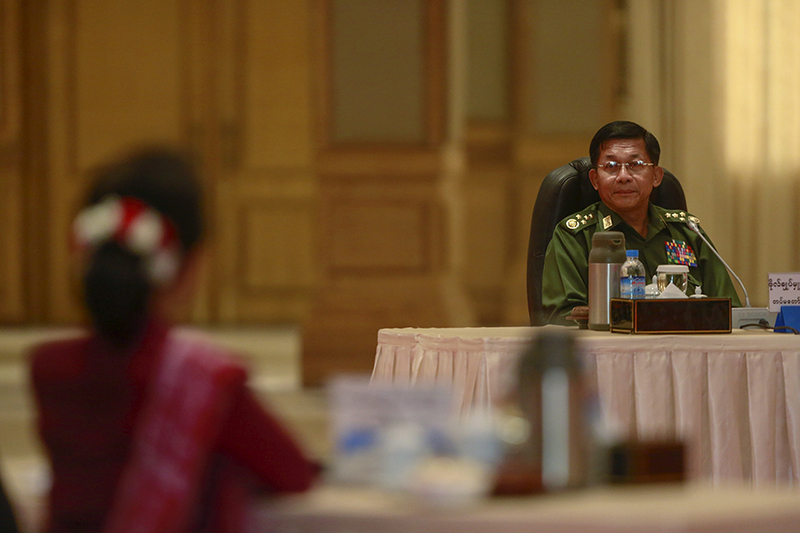 In terms of the democratic transition, Myanmar’s first elected civilian government in decades, led by the National League for Democracy (NLD), has had no shortage of enemies over the 18 months since it took office in March 2016. The previous ruling party—the Union Solidarity and Development Party—formed by the ex-military junta, allied political groups and nationalists, is at the top of the civilian government’s list of enemies. Obviously, in terms of democracy, it would seem that Myanmar’s powerful military is not on the side of the civilian government. The military’s main task is to safeguard the undemocratic 2008 Constitution which the government has pledged to amend. The main political tasks of the government and the military, therefore, are in direct conflict. This is still the biggest problem facing Myanmar’s transition. The recent militant attacks brought more “enemies” to the NLD administration, including, of course, ARSA, which was quickly denounced as a terrorist organization by the government after it claimed deadly attacks on 30 security outposts. Other new “enemies” include aggressive international ARSA apologists, international rights groups, and foreign media portraying Myanmar as a nationalist Buddhist country and humiliating elected leader Daw Aung San Suu Kyi. Many people in Myanmar are worried that Rakhine instability—reinforced by one-sided international portrayals of the conflict—might bring their country back to the dark era of military rule which the population endured for five decades between 1962 to 2011. The prospect is a nightmare that no one wants to think of except opportunists from that era. Domestic political enemies of the new civilian government—especially the old establishment—have been waiting for that opportunity to make a comeback. If that worst-case scenario occurred, the world would see its newest champion of democracy vanish in the Southeast Asian region—where many countries have ties to the monarchy, the military and authoritarian systems of rule. It will also have ripples across the world, where anti-Western leaders like Putin in Russia and Erdogan in Turkey are rising in popularity in their countries. The situation in northern Rakhine is unprecedented—hundreds of thousands of Muslim refugees have fled to Bangladesh and many villages in Maungdaw have been reduced to ashes. The conflict needs to be stabilized as soon as possible and all concerned authorities—mainly the government—need to take action against those responsible for atrocious acts against civilians. International news coverage and the West’s position on the conflict have portrayed Myanmar as a hostile nation of Buddhists opposed to the self-identifying Muslim Rohingya minority. Articles have also depicted the country’s de facto leader Daw Aung San Suu Kyi as implicated in the burning of villages and the killing of civilians, because she didn’t show the sympathy expected for Rohingya refugees and condemn the military’s clearance operation against Rohingya. The New York Times published a story on Sept. 9 saying “Aung San Suu Kyi is presiding over ethnic cleansing in which villages are burned, women raped and children butchered.” The UN chose to use the term “textbook example of ethnic cleansing” for the exodus of refugees and human rights violations by security forces. On Sept. 15, The New Yorker magazine in the United States published a story with the headline “Aung San Suu Kyi, the Ignoble Laureate” while the Telegraph in the United Kingdom published a story the next day titled, “Aung San Suu Kyi: Burmese Military Prisoner or Monster?” These are just a few examples out of many. This is not only an insult for Daw Aung San Suu Kyi but also for millions of Myanmar citizens who have chosen her to usher the civil war-torn country towards a brighter future. All these descriptions have gone far beyond the reality in the country. And one fundamentally important fact such people from international community might have forgotten—perhaps deliberately—is that she has received a solid mandate from the people of Myanmar in the 2015 election when her National League for Democracy party won a landslide victory across the country. Many groups and institutions in the West are humiliating Daw Aung San Suu Kyi as well as the country. Unison, one of the UK’s largest trade unions, announced it had suspended an award given to her when she was placed under house arrest. The London School of Economics’ student union said it would be stripping Daw Aung San Suu Kyi of her honorary presidency. Some people and groups in the West aggressively called for Daw Aung San Suu Kyi to be stripped of her Nobel Peace Prize and other awards bestowed on her for her work for democracy over the past decades. Daw Aung San Suu Kyi has not responded to such calls. But in the eyes of the majority of Myanmar people, they would see those institutions and people in the West as humiliating the leader they love and believe in. At this point, we’ve seen the seeds of anti-Western sentiment sprouting among Myanmar’s public. On Sept. 19, when Daw Aung San Suu Kyi made a diplomatic briefing on the Rakhine conflict, many people gathered in public areas in several big cities like Yangon and Mandalay to show their solidarity with the State Counselor in the face of international pressure and what they saw as humiliation. Actually, most Myanmar people could be described as “pro-West”—valuing Western concepts, including democracy. The main reason the Myanmar people like the West is that the United States and some European countries supported their democracy movement after the military cracked down on a nationwide pro-democracy uprising in 1988. But now some of them are starting to feel that the West is bullying Myanmar people over the Rakhine conflict, which is only one of the problems Myanmar is facing. The West shouldn’t repeat mistakes that they made in the past, that have antagonized its allies to choose anti-Western leaders like Putin in Russia and Erdogan in Turkey. Political scientists concluded that without the West’s threat to expand the Atlantic alliance into Ukraine when Putin was elected in 2000, Russia wouldn’t have taken Crimea back, leaving “no choice” for Putin. Making the bold decision to distance itself from the Islamic world in 1987 and move closer to the West, Turkey applied to be a member of the European Economic Community, the predecessor of the European Union. It was denied membership for decades as Europe embraced other smaller countries like Slovakia and Estonia. Political scientists suggested that Europe had humiliated Turkey. Arguably as a result, Turkish people voted for Erdogan in 2003, who they believed could stand up to Europe as a strong leader. When it comes to the government and the military—the most powerful and untouchable establishment in the country—we know that they are not together, but that they are supposed to work together on issues like the Rakhine conflict and the country’s peace process. Sometimes, the military can be singled out for issues that concern it only, but we have to understand that the democratic transition can only advance if the civilian government and the military collaborate more. After all, the bigger picture much of the West does not see of this complex country is that there are only two main camps regarding political ideology in Myanmar: the pro-democracy camp and the anti-democracy camp. The incumbent government is in the pro-democracy camp while the latter is comprised of the old establishment and its associates. But what the international community is now portraying is the perfect scenario for the anti-democracy camp of Myanmar to bring down the democratic government. The country is still wrapped up in its core fight: democracy versus military dictatorship. It’s not over yet and the old establishment and their allies are still trying to come back. The fight will only be over after the undemocratic Constitution is amended and the military have returned to their barracks. That’s what Daw Aung San Suu Kyi’s government has been trying to achieve. 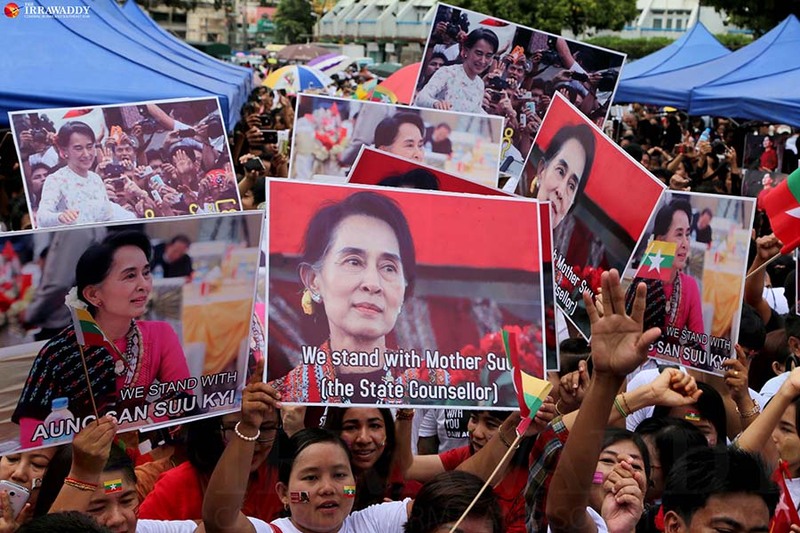 In this fundamental battle, many people in Myanmar still support Daw Aung San Suu Kyi and her government despite its shortcomings and inabilities. They understand it is not an easy task. Currently, Myanmar is still in the beginning of a transition, cleaning up messiness left over from decades of authoritarian rule and fixing those while dealing with the powerful military, as well as anti-democracy and nationalist forces. For people like self-identifying Rohingya whose rights have been taken away and abused overtime, only the democratic government can bring back their basic rights. To solve the problems of the Rakhine conflict, the government has started implementing recommendations made by a commission led by former UN secretary-general Kofi Annan, despite resistance from opponents and the military. It will need a certain amount of time. If the instability in Rakhine and the international community’s distorted portrayal of the situation lead to the collapse of the elected civilian government, there will be no other democratic institutions or parties to replace that power vacuum here in Myanmar—only the military and its associates. In this disaster scenario, everyone loses except the old establishment and its allies. One of the world’s newest democracies will vanish under the military’s boots and the Myanmar people will suffer once again.